A long time ago, I began to have my first doubts about the manner in which NFP was frequently being presented. I remember hearing something like this, “With NFP, couples can be 99% sure of not having another child,” or “As good as contraception, but without the health risks (of contraceptives).” And this was said to young couples with no grave health problems. It appeared that NFP was being promoted in an anti-life way. It seemed like a contraceptive mentality pervaded most of these supposedly pro-life, pro-family presentations. I have come to believe these attitudes towards married life and motherhood are actually harmful to the pro-life cause. In this article, I wish to examine some of the more subtle ways the contraceptive mentality has pervaded society, and even the thinking of some more serious Catholics. I met an older lady who seemed to be a devout and committed Catholic. (She was a daily Mass-goer, etc.) but on the subject of NFP she gave me rather a turn. She took me aside one day after Holy Mass, and explained to me that, as I was a young person (I was 18 at the time), I should tell the young people I met about NFP so that they would not have children. This seemed odd to me, for I had the conviction that what I should do is encourage people to give up promiscuous behavior, not instruct them in birth control methods, which might only serve to encourage or confirm them in their sins. I also spoke with some the older people who did not seem to care if their daughters lived with their boyfriends for months or even years, as long as no children resulted. Some of these “good Catholics” even promoted the frivolous use of NFP by married couples: never mind that the Church requires a grave and serious reason for NFP to be used for birth control purposes. “But,” someone will doubtless object, “if we don't give couples an alternative form of birth control, they will use chemical contraceptives.” This is the classic, “lesser of two evils” argument, and it sounds reasonable enough, but it has been observed that the lesser of two evils is evil still. The Saints taught that a Catholic must not commit the smallest evil, not even if you think the greatest good would result. So, rather than teaching people to use NFP for frivolous reasons (a “smaller” evil), one ought to encourage people to do a positive, actual good. In other words, instead of saying “Learn this so you won't have children,” people ought to be taught that having a family is a good thing, children are a blessing, and babies are part and parcel of the married vocation. 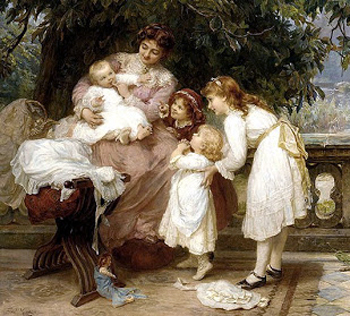 Motherhood is high and holy, and continued maternity is honorable and beautiful. It encourages a spirit of generosity and selflessness in both parents, which is truly the Catholic Spirit. Large families are also good for the Church and for vocations. Did you ever notice how many saints have come from large families? Another consequence of the contraceptive mentality is to induce young people to regard marriage as unnecessary. Think about it: a girl who wants to have a big family and a stable home in which to raise her children. It goes without saying that she intends to marry. But, on the other hand, if a girl is taught to look upon children as a thing to be avoided, her chances of using contraceptives sky-rockets - leading to a false sense of security and probably to have several uncommitted boyfriends. The contraceptive mentality, even if contraceptives are not actually being used, encourages a disregard for marriage. Conversely, a pro-baby, large family-friendly mentality actually safeguards chastity, and stresses the importance and sacredness of marriage. I have been deeply troubled by the modern contraceptive mentality that has led to the use, or rather abuse, of Natural Family Planning by couples who have no “grave and serious reason” to avoid having another child. We need to pray and work for a return to the faithful generosity of our ancestors, who did not try to out-think God but rather trusted in Divine Providence. To those couples who essentially close the door to the possibility of bringing another immortal soul into the world, they should be reminded that had a certain French couple decided to limit their family with NFP, St. Thérèse of Lisieux, “the greatest Saint of modern times,” would never have been born. St. Thérèse, you see, was the youngest of nine children. Married couples, if God wills to send you another child, that is a soul He has intended to create from all eternity, and that child is a part of His plan for the world, destined to bring other souls to Him. How many saints would have never been born if their parents would have refused to trust Divine Providence? Consider this case: A farmer and his wife were expecting yet another child. He already had several children to support and in addition his wife was in poor health, having miscarried three children before. Now she found herself pregnant again. No one had been there to teach them about Natural Family Planning. If there had been, maybe they would not have found themselves faced with another difficult pregnancy that would likely end in yet another heartbreak. After all, theirs seemed the ideal case to justify not having any more children. Months before her due date, the farmer's wife went into a long and difficult labor and gave birth to a sickly, premature little girl. So frail was the little girl that it was necessary to baptize her that very day as it seemed she would die any moment. But the baby, called “Cechina” because of her small size, did survive, though she was to spend the rest of her life with ill health. The poor parents could have been spared all this stress and sorrow if they had just known about Natural Family Planning... but if they had, little Cechina, later known as St. Frances Xavier Cabrini - perhaps the greatest woman missionary in the history of the Church - would never have been born. Had that Italian couple decided to engage in a worldly notion of “responsible parenting,” the Church - and the whole world - would have been robbed of the immeasurable missionary efforts of St. Frances Xavier Cabrini. 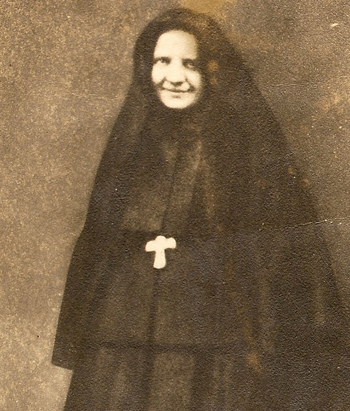 Mother Cabrini, as she came to be known, was the youngest, the 13th child born to that Italian couple.